There are people in our lives who have an influence they’d never know. My parents instilled a love for Cape Cod that we find in many ways living here on San Juan Island in Washington. The friend in California who suggested a year or so ago that I rein in this blog to a remodeling theme: remodeling a house, remodeling a life—the same thing, in my book. Our daughter, now living in Argentina, who upon visiting before her departure grew my daily walk by a beautiful mile or two. And in sending me a video of the works of sculptor Anthony Howe on neighboring Orcas Island, my cousin in Atlanta reminding me to stay with art every day. And to try not to stray. They are all part and parcel of who I am, why I’m here, and how I see it. “Walking the loop” began as a tradition while living on upper Queen Anne in Seattle and continues out here today. That first loop took me around the perimeter of the hill, overlooking the Space Needle and downtown Seattle, Lake Union, and Puget Sound. Today’s loop takes me alongside Westcott Bay, and through the red, white and blue nostalgic quality of Roche Harbor Resort where everyone looks good in the light. Finally, the road meanders through an old growth forest of cedar, fir, and pine where everything grows dark and green, and back to my home on the bay. Where the road dips down to the shoreline I experience what I call a Cape Cod moment, framed by flatlands, grasses, marshes, and horizon. In the course of this walk I may pass only one or two cars on the road, a few more in summer, on an island where every driver waves. This is the walk my daughter grew, taking it out on a point to new terrain, the posh end of White Point Road. Here I pass tennis courts where nobody’s playing, a pond with a dock establishing someone’s swimming hole, and a private golf course back in there somewhere, for I’ve seen it from the water. Horse fencing and regally high pampas grasses standing like sentry guide the way. Crushed white shells underfoot line the one-lane road at sea level. It’s as private as private can be, except for me, out on this point. Here I gape at houses, something that seems to be my lot in life: the desire to see myself in other spaces, other places. On walks I finish unfinished houses in my mind, or tear them down and start again. As anyone in the field knows, design is never done. When the bones are good, I may mentally repaint it, or envision it clad in cedar shingles, dark, red, natural or a weathered gray. At home, the short video on the kinetic sculpture of Anthony Howe awaits me. It’s mesmerizing. How did my cousin know to send this now? I needed it. Isn’t art what ultimately pulls us through? All the arts, always. And art as balm, particularly in troubling times. Which is where we are today. Because I grew up on the East Coast, I still get a kick out of towns, hills, creeks, rivers, and roads with Western names. Raised on enough Westerns for it to be a part of my television DNA, I don’t think a born Westerner would derive the same pleasure, as I made note on an impossibly long drive the names: Sweet Briar, Tom Cat Hill, Lost Man Creek, Rogue River, Wonder Stump Road, and dozens more. As a writer, I may use them someday. “It sometimes takes a foreigner to come and see a place and paint it,” David Hockney once explained. We did not know then, on our drive to San Francisco, that we would be attending Hockney’s “A Bigger Exhibition” at the de Young Museum in Golden Gate Park. But that’s just what we did. And it made sense. It made sense of everything. Having studied at the Royal Academy of Art in London, Hockney moved to Los Angeles in the 1960’s. There, the extraordinarily talented British artist immersed himself in swimming pools, mid-century architecture, palm trees, portraiture, and the Southern Californian sun-drenched light for twenty-five years. Returning to his native Yorkshire, England in 1996, “A Bigger Exhibition” covers the years since his return to England. Hockney’s 21st century art, one might say. More than ever now his subject is light, from the bleakness of winter to the excitement of its return in spring and summer, and throughout the hours in a day. “People don’t look very hard,” notes Hockey. “I do, and I do something with it.” 300+ works make up this monumental and expansive exhibition in oil, watercolor, charcoal drawings, digital films, and iPad paintings. 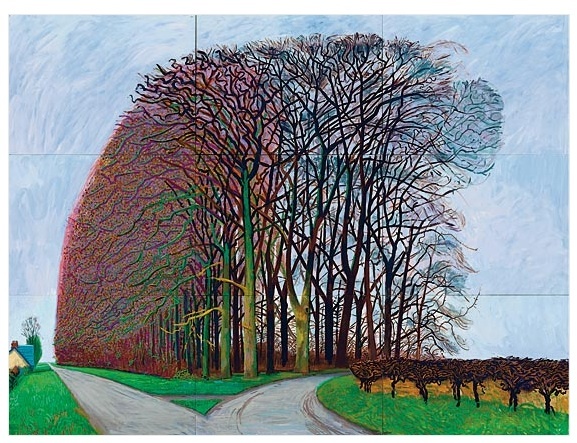 A seventy-six year old man today, Hockney is running circles around us and calling our attention to the world. Stepping out into the park, every which way I turned was a “Hockney.” The sunlight through trees, the trees bereft of leaves, and this sensation continued all the ride up the coast toward home. The Tuscan hillsides of Napa and Sonoma, the cathedral-like presence of redwood forests, the Big Sur experience with rocks, the Pacific as a sheet of mica, and gleaming white towns along its edge. We took the long coastal route back, following the contours of hills and river beds on roads that switched and turned south, then north again. The Old Coast Highway. And I saw it all through David Hockney’s eyes. 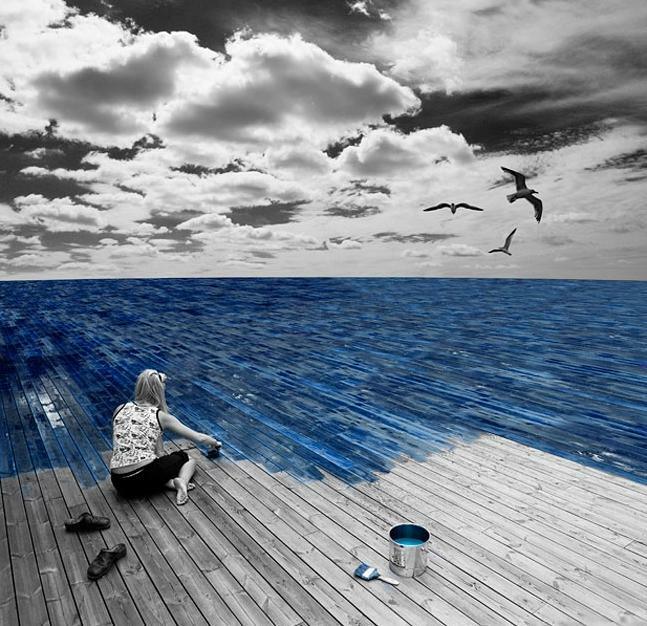 This is why we need artists in this world. The first time I visited Santa Fe, New Mexico, I approached the city by driving up from Albuquerque. “Land of Enchantment” passed me by on every license plate, as I was fixed to all the landscape in my field of vision. Face glued to the window, fogging up the glass with my breath and smudging it with my fingers, I was having one of those ecstatic moments–there really ought to be a word for it–when life imitates art. I was seeing a place where I had never been through the eyes and handiwork of Georgia O’Keeffe. This woman whose life story I knew so well and whose art I had loved for many years. She was out there still, everywhere, in the desert and sagebrush, red rocks and purple hills, on the mesas, trails, and in the enormous clear blue skies, painting it all. I could taste the dryness in the air and smell mesquite burning in the distance. Like the child in Walt Whitman’s poem, “There Was a Child Went Forth,” everything I saw was familiar to me, and I knew a part of me had always been, and would always be, there. Oh, how I wish I had the word for it, when life and art collide. Paintings, poetry or prose, these are the moments most worth living for, in my experience. Recently I was handed another one. Again, I was in a moving car, this time through a snow covered landscape, making our way like a sleigh to Logan Airport in Boston. I had been visiting my parents’ in their retirement village on the South Shore and my mind was elsewhere. “Lulie!” I cried, before I could catch myself. You need to know that I had recently written a novel, Black Angels, in the course of completing my MFA, and had named one of my main characters Lulie Blessington based on two of my parents’ friends: one named Lulie and the other by the last name of Blessington. I had never met Mrs. Blessington, but I loved the sound of the names together and thought it worked for the feisty up-from-the-South character that was my Lulie. You need to know I had been living in that novel for years, and in that instant, she was practically before me. Well, not exactly before me, but let’s just say the seat was warm with her presence. years, or stretching cycles of years. always go forth every day.